In 1935, W.H. 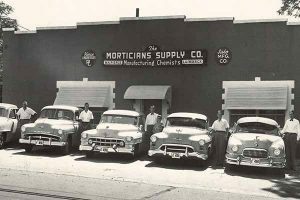 “Bill” Pierce and his wife moved to Dallas, TX, during the depression to start a small funeral supply business called Morticians Supply. Bill Pierce, a licensed funeral director / embalmer himself, knew what supplies a funeral home might need. More than that – he could see the changes that were to be made over the coming years, and he had innovative ideas on fluid design. Mr. Pierce began Pierce Chemical by visiting funeral homes in the states of Texas, Oklahoma, Louisiana and Arkansas during the week and returning to Dallas to make the fluid over the weekend. At that time Mr. Pierce was the president, production supervisor, salesman and shipping clerk. Over the years Pierce Chemical continued to grow and the need for additional staff became evident. Mr. Pierce hired L.G. “Darko” Fredrick who in 1959 would help author the book “Principles and Practice of Embalming”. Mr. Paul Bollman was also hired and helped Mr. Pierce manage the outside sales team. Pierce Chemical remained in the original location with the addition of adjacent buildings until 1987. The business had grown and Pierce was now selling across the United States. The move into the current 60,000 square foot building was needed to accommodate the company’s growth. In 1990, Mr. Pierce acquired the Royal Bond Company in St. Louis which doubled the volume of the company overnight. 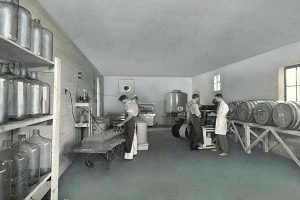 The purchase of Royal Bond brought him full circle since he had started his career while in mortuary school with the Royal Bond Company in the 1930s. Along the way, Mr. Pierce also purchased Armstrong Chemical Company, Naturo Fluid Company and Eureka Fluid Company which all became part of Pierce Chemical. After the death of Mr. Pierce in 1998, his nephew, John Firestone, became the CEO of the company until the end of 2012 when he sold the company to Wilbert Funeral Services, Inc. Mr. Firestone remained on as President of Pierce until his retirement in 2014 and remains a Board Member of the Pierce Colleges. On June 1, 2014, Lance Ray was appointed Executive Vice President / COO of Pierce Chemical. Mr. Ray is a licensed funeral director / embalmer and graduated from the Dallas Institute of Funeral Service, a Pierce College, in 1994. Prior to joining Pierce, Mr. Ray had spent twenty years in funeral service and working as part of the Wilbert Funeral Services organization. Wilbert Funeral Services, Inc. (WFSI) and its affiliated organizations under The Wilbert Group umbrella provide a wide range of products, services and education pertaining to the funeral service profession. With a heritage dating back to 1880, WFSI develops burial vault technology and fabrication standards, licensing the manufacturing of the burial vaults to a network of nearly 200 Licensees throughout the United States and Canada. A portion of the 200 locations are owned and operated by WFSI. Wilbert and its network also provide cremation urns, mementos, keepsake jewelry and other memorialization products. Today Pierce Chemical manufactures and distributes from their home office in Dallas, Texas. The company also has a distribution center in Fenton, MO where they also build the Duotronic embalming machines and other custom embalming instruments. Together with their shipping, production, inside and outside sales team Pierce continues to serve funeral homes with the best products and services.